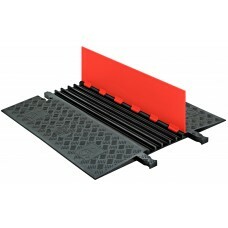 The low profile Guard Dog® range is ideal for situations where many smaller cables or hoses are in need of protection or a less intrusive cable protection system is needed. The reduced height of the low profile Guard Dog® range means that it is ideal for use in areas where there is high pedestrian traffic. 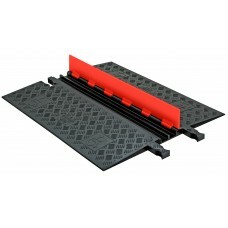 The ADA compliant variant of these ramps is essential for providing easy access for users who have impaired mobility. They also double as a great crossing point for small vehicles such as golf carts, buggy’s and smaller trucks. Using Checkers® patented 5-bar surface chequering the Guard Dog® Low Profile range has excellent surface grip for both pedestrians and vehicles. The lid is hinged at one side allowing cables to be contained out of the way, the lid is also fixed so cannot be unintentionally removed and lost. 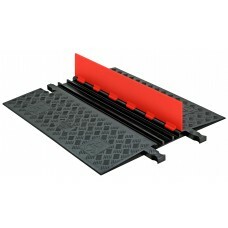 Just because it is smaller does not make the low profile range any less hard wearing than the standard profile range. It can still take knocks, scrapes and abrasion, as well as some pretty impressive weight loads. Need help choosing the right cable protection? If you need assistance in choosing the right cable protection system please call us toll free at (800) 671-9662.